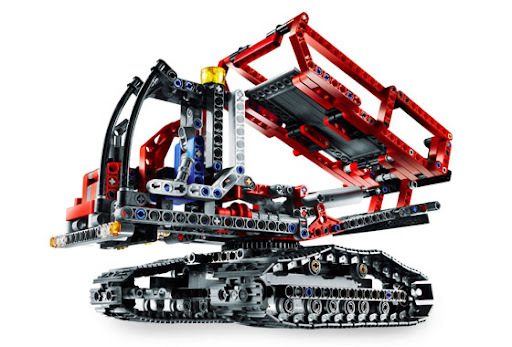 Today we have the first TECHNIC set review at TBs . I'm using a brand new review template not yet tested, which I'd expect to be of your satisfaction and to fine tune in the future, according to your feedback. Here some images from this set box. It is a medium sized box and usually quite larger than required for its contents. While it looks nice on the shelves for the general costumer, it is a problem for the collectors who want to keep the boxes. On the backside you may find mainly images from the main model in combination with the PF Motor Set (8293) and the B-model which is a Tracked Dumper. The box design has two seals in the front and the perforated top that flips up, which turns to be a relative solid casing. As for the contents, you may see them also below. A few bags (5) numbered and two large parts in the box (One 8x16 DBG tile and one 8x10 digger bucket). Includes also the manuals and one sticker sheet. The building instructions are divided in two books for the main model. They are nearly A4 sized, with 48 pages each and 38 major building steps for the main model. I've found no errors in these. In the end of the second book you will find an inventory of included parts (spares not accounted) which is now also a standard and represents a very positive progress. Just before, in the same book, you get also detailed instructions to integrate the main model, with the PF Motor Set elements (8293). With them you can integrate a PF M-Motor to operate the boom, dipper/bucket and a PF Pole-Reverser that avoids the need to act on the PF Battery Box which is assembled in the bottom of the drive train. But of course you may also easily integrate the PF Lights included with the same 8293 set. Others already went even further by motorizing other functions like the turn table, or independent motors for boom and dipper/bucket (like Martyn, here). The numbered bags intend to make the construction easier and faster by using parts from a specific bag for each instructions section. 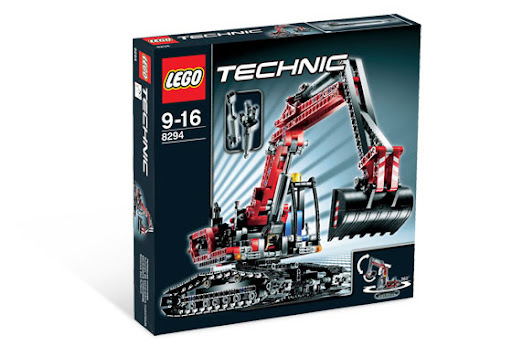 In my opinion it wouldn't be exactly required for such medium sized set, specially when we can find much larger TECHNIC sets with with no numbered bags. But I'm suspect to speak as I prefer to open all bags and put the parts together in the box before start to build. This set comes with a few new parts which is one of its main interests as I'll explain ahead. Inside you will find a pair of the new TECHNIC Linear Actuators (from which a lot have been written recently) and respective brackets from one single kind though (the PF motors adapter appears just one exemplar at the also new, Telescopic Handler, 8295). For a more detailed analysis of these new parts, take some time to read this post. It includes also two of the new U-joints (3rd generation), whose main characteristic is the fact they got a shorter length. 3L instead of the 4L in the former version (already 31 years old). This shorter version will allow to use them, where it was impossible to do before and is of special interest to route the driving axles into the new LAs. One of the main concerns about this new U-joints was their potential fragility, which was already the main problem from the former version, as they are know to easily break under high torque conditions. Hopefully TLG may have improved this fact as they look a bit brighter than usual, which may suggest a different kind of ABS being now used also for this part. I can't be sure, so we will see once the users reports will start to come. In my opinion the new parts are the main interest of this set, because it is the smaller and cheapest one, at the same time it is the unique to come with two LAs. So it will be one of the most effective ways in the short term to get LAs at a reasonable price. I guess this is an argument more than enough to make this set a best-seller and to invite many of us to buy several (I've ordered four of them...). With this set, color coding of parts like: gears, pins and axles continues as a trend of the actual TECHNIC line. It makes the building experience easier, mainly the part searching process. On the other end turns the sets more colorful which may not be so nice looking for everybody's taste. 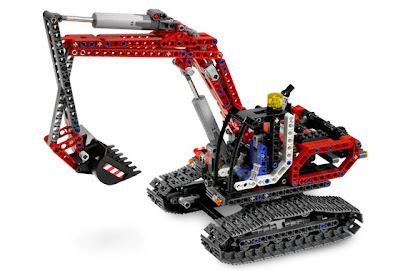 As wrote a few times here at TBs , Excavators are one of my favorite subjects for a TECHNIC model, so I got very happy when saw this would be a new model for 2008. Despite it is much more functional than 8419 in 2005, I would loved if one of the largest TECHNIC sets have been dedicated to this type of machinery (maybe the next time...). It is a sort of 8851, more than 20 years ago, made of modern and brand new parts. Of course with lots of extra potential made possible by all the PF elements now available. In terms of design, we are in front of a very good exemplar, where beside a good set of functions it is also very a nice looking set. All design details look very well proportioned, from the drive train to the cab and the boom/dipper arm. Despite I'm not personally favorable to the use of stickers (and haven't applied them for this review), I've to admit that even these small ones included, can contribute to improve the overall set looking. The set building starts with the drive train (below). Its construction is a bit monotonous because it includes 4 parts almost identical (the tread sprocket wheel blocks), however they are illustrated in two sequences to make it a little different. Then the completed track group from one side is just repeated once for the other side. In fact there is no other way, as a treaded excavator, is exactly that way! The drive train includes the modern tread sprocket wheels and wide tread links. These could have been the new ones in black, instead of DGB, which would look also great in this model. Found curious the use of a 2L axle with one bush at one side and on top of the drive train chassis. It might be used to prevent rotating the body continuously in the same direction if there is one or more PF cables (pole-reverser and/or lights) going from the battery box on the drive train to the cab, I think!? The drive train, has enough space in the bottom, to accommodate a PF battery box and one or two PF M-motors to drive some functions. The building sequence proceeds to the cab . This is where the first LA and respective bracket fits. Movement transmission to the LA is accomplished by some 12 and 20 tooth bevel gears. The transmission mechanism which allows to select between two functions, also fits inside the Excavator body. It uses a red transmission 'driving ring' which turned to be quite common in TECHNIC sets for selectable functions. For Excavator boom and dipper/bucket manual operation, there is a double bevel gear on the cab backside. Because the end-to-end mechanisms for both have the exact same gear reduction ratio (1:2,4) and the LAs need about 26,5 revolutions to fully extent/retract, the user just need to perform about 11 complete revolutions on the backside gear, to go from one end to the other (either boom or dipper/bucket). The third an final step is dedicated to the boom, dipper and bucket arm. There fits the second LA and respective bracket, where the rotating movement arrives with the two new sized U-joints. As I mentioned before this allows for more compact designs. Bucket and dipper arm movements are combined together and actuated by the same LA on the top, while boom is actuated by the LA attached to the cab. Below some images from the set, after completion. The final part from the building instructions, is dedicated to the 8293 PF Motor Set integration with the main set. The PF Battery Box goes to the bottom of the drive train. The PF M-Motor fits into the cab after some parts removal (function selection still available from the transmission box) and the PF Pole-Reverser lies behind the cabin (it's used to invert motor direction, without the need to slide the PF Battery Box switch on the bottom, to do the same. This is a medium sized model with a rich set of working functions to play, for its size. A transmission box where it can be chosen between two functions. Realistic movements for the boom, dipper arm and bucket. Brand new functional linear actuators, with lots of other applications. Cab rotation on top of the drive train. Integration with PF elements for motorized functions. Possible integration with PF lights, included in 8293 set, despite not documented into the building instructions. It is in fact a very good and well designed model, which features a set of interesting functionalities. However also the cab rotation could have been done some other way, than manual. Perhaps it was intentional to increase immediate movement experience in favor of playability, and we have to wait for a larger and remotely controlled Excavator to get a mechanism included here. It could certainly justify hours of amusement for any adolescent or even adults. The 2nd model suggested by the designers for this set, is a tracked (what else could it be, to fit with parts from the main model ;)) loader or dumper, whatever you would like to call it. The respective building instructions will be available for download from the LEGO Customer Service building instructions webpage, however still not available at the date when this review is being written. At least the drive train looks to be identical. To conclude I'd like to say despite being a studless model, we don't have a feeling of emptiness, characteristic of many other studless sets. This is in my opinion a very positive aspect and definitly shows that studless models can really take a place in the most conservative TECHNIC fans. I liked your template for set reviews. You could add weight information too. If you have chance to weight them..
8294 seems to be a very solid model. I completely agree with you that it's not emtpy like most other studless sets. This years models are much stronger than the previous ones. I'm looking forward to see your 8297 review! I was making a spell check on the post and small adjustments, so I decided to include your suggestion. I hope this is only the first about new models..
As for the model itself, I repeat the comment I made at a previous blog entry: MANUAL CAB ROTATION! ARRGH! It wouldn't make the set cost go through the roof if the designers added some rotation mechanism, even a simple pair of gears like on the 8270 Rough Terrain Crane B-model. I'd accept if the mechanism had to be removed to add the PF battery box. I bet the 8x16 tile to be used on the Tracked Dumper, like on the B-model from 8292 (Cherry Picker). see about the black treads here. you will, right next to the arm attachement see a grey brick (4211865)extending a little bit above the frame. If you push it down, it will stop the rotation by hitting the aforementioned rod. Hope to see a review of the 8297 Off-Roader as soon as possible! I always like to reed other people opinion! Me, i got me the 8297 Off-Roader yesterday after wating for it for so many months! Thank you for providing this information. I would like to know where attain a copy of the A-Model instructions over the internet. I misplaced the hard copy that came with the kit. You may find them at LEGO website. Just look for 8294, here. I have broke apart my excavator apart a few years ago, and it was my first ''large scaled'' technic vehicle. But about cab rotation, if you put a axle from the light on top of the cabin downwards and you let it pas trough axle holder, and add a 24 teeth gear at the bottom, you got your problem solved. Hope it helps you.